Imagine for a moment going through border controls with a panoply of gaffa tape rolls, ping pong balls, kitchen foil, little hammers, guitar strings, pegs and other random objects, all with the purpose of playing music. This is a daily occurrence for German musician Hauschka, who has made the prepared piano his instrument of predilection. Hailing from Düsseldorf, Volker Bertelmann, a classically-trained pianist, released his first album, Substantial, on Karaoke Kalk in 2004, and followed it with the self-explanatory The Prepared Piano a year later. Signed to Fat-Cat’s modern classical sister label 130701 since 2007, Bertelmann has since considerably developed his composition style, and his latest offering, Foreign Landscapes, represents once again a massive step forward. Partly recorded in San Francisco with the Magik*Magik Orchestra, and later on in his native Düsseldorf, Foreign Landscapes is an album with many facets, at times delicate, romantic, sophisticated or slightly melancholic, at others vivid, luxurious or refreshingly playful, yet, the pieces flow perfectly, contrasting with each other without ever clashing. Bertelmann’s compositional skills and musicianship are given much scope here, his piano, at times fluid and exquisite, at others altered to the point of sounding dry and lacking the most basic eclat, as is the case on Iron Shoes, provides a series of counterpoint to the rich motifs played by the formation. This is very much the case on opening piece Alexanderplatz, where discreet touches keep the pace going, while it is a shimmering set of tiny noises which give Snow its beautiful textural feel later on. Elsewhere, the piano virtually disappears, leaving the quintet of musicians sole in charge. This gives Bertelmann the pianist the opportunity to step back and leave Bertelmann the composer to showcase his work. Here, the music is often at its busiest and most joyful. Union Square and Sunny Mission especially appear infused with the hustle and bustle of city life, while Children is equally driven by a dynamic which gives it a wonderfully pastoral feel. Madeira however denotes a much more subtle, less busy, tone, and closing piece Trost, while still fairly ornate, especially in its second half, has a touch of minimalism in its main theme which contrasts with some of the more intricate earlier compositions. Even on the solo pieces, Bertelmann’s performance has gained in ambition and he can be found juggling contrasting moods with great assurance. On Mount Hood for instance, he creates a somewhat melancholic piece, its melody underlines by plucked piano strings, but the constant distraction of ping pong balls and other objects resonating in the body of the instruments adds a level or mischievousness. This is also the case, albeit to a less extend, on Early In The Park, while on Kouseiji, the bouncing ping pong balls add a touching note to the music and hint at just how versatile added objects can be within a piece. Bertelmann initially collaborated with the formation during a concert in San Francisco a couple of years ago, and was said to have been particularly impressed with the way the formation responded to his music. This, it seems, inspired him to write for a much wider set of instruments than he had done until now, incorporating strings, trombones and clarinets into his work. The result is a superb record, which benefits greatly from the subtle variations encountered throughout. Very much like label mate Max Richter, Volker Bertelmann continues to develop a voice all of his own, and this latest opus shows him at his most ambitious to date. 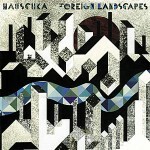 Hauschka – Making of Foreign Landscapes part 1 from FatCat Records on Vimeo. Hauschka – Making of Foreign Landscapes part 2 from FatCat Records on Vimeo. Hauschka – Making of Foreign Landscapes part 3 from FatCat Records on Vimeo.